Functional genomic studies are dominated by transcriptomic approaches, in part reflecting the vast amount of information that can be obtained, the ability to amplify mRNA and the availability of commercially standardized functional genomic DNA microarrays and related techniques. This can be contrasted with proteomics, metabolomics and metabolic flux analysis (fluxomics), which have all been much slower in development, despite these techniques each providing a unique viewpoint of what is happening in the overall biological system. Here, we give an overview of developments in these fields 'downstream' of the transcriptome by considering the characterization of one particular, but widely used, mouse model of human disease. The mdx mouse is a model of Duchenne muscular dystrophy (DMD) and has been widely used to understand the progressive skeletal muscle wasting that accompanies DMD, and more recently the associated cardiomyopathy, as well as to unravel the roles of the other isoforms of dystrophin, such as those found in the brain. Studies using proteomics, metabolomics and fluxomics have characterized perturbations in calcium homeostasis in dystrophic skeletal muscle, provided an understanding of the role of dystrophin in skeletal muscle regeneration, and defined the changes in substrate energy metabolism in the working heart. More importantly, they all point to perturbations in proteins, metabolites and metabolic fluxes reflecting mitochondrial energetic alterations, even in the early stage of the dystrophic pathology. Philosophically, these studies also illustrate an important lesson relevant to both functional genomics and the mouse phenotyping in that the knowledge generated has advanced our understanding of cell biology and physiological organization as much as it has advanced our understanding of the disease. The completion of genome projects, such as those associated with the mouse  and humans , heralded the field of functional genomics, in which high-throughput approaches are used to profile a tier of organization in a cell, tissue or even organism after perturbation of a gene's function in order to deduce what the function of that gene is. By far the commonest approach used in the armory of functional genomic technology is probably the DNA microarray, which is used to profile the transcriptome that results from a gene manipulation. Although this technology has proven to be incredibly powerful in deducing the consequences of certain genetic modifications, there are situations in which such an approach may not be successful. Approaches based on transcriptomics make the assumption that altered concentrations of mRNA are reflected in the proteome, but this may not be true if the concentration of a given protein is determined by the rate of its destruction. Furthermore, although long-term changes in the function of a cell or tissue may be caused by changes in gene expression, in mammals many medium-term changes arise from protein modifications, such as phosphorylation, acetylation and ubiquitylation, although short-term changes are often caused by allosteric modifications, reflecting rapid transient changes in metabolites. This has led to tools to profile the proteome and the metabolome of a cell, tissue or organism to complement approaches using transcriptomics. In addition to understanding gene function, functional genomic technologies have also been used to help in phenotyping organisms. One of the first applications of metabolomics was in the phenotyping of yeast (Saccharomyces cerevisiae) mutants in which genetic modifications had produced 'silent phenotypes' in terms of the growth rate, the main phenotype used to distinguish mutants . Raamsdonk and colleagues  described an approach described as 'functional analysis by co-responses in yeast' (FANCY), which distinguishes different classes of yeast mutants by global metabolic changes [3–5]. Such a process of defining a phenotype through the global changes induced in metabolism can be used to predict the function of genes deleted or upregulated in a given system through comparative metabolomics. The definition of a metabolic phenotype, or metabotype, by large-scale analysis of metabolites using either 1H nuclear magnetic resonance (NMR) spectroscopy or mass spectrometry (MS) has found many applications in genetic engineering, toxicology and disease diagnosis in plants, animals and microbes [6–9]. Similar to metabolomics, metabolic flux analysis using isotopically labeled substrates can provide novel and unexpected insights into the metabotype of normal and diseased cells, tissues or organisms. The use of isotopes provides unique insights into the dynamics of cellular metabolism and its regulation, information that is not accessible from static measurements of mRNA or protein expression or metabolite concentration. This subdiscipline of metabolomics, which has been referred to as tracer-based metabolomics, dynamic metabolomics or fluxomics and is probably the least developed of all functional genomic technologies, builds on stable isotope methodologies that have been developed over the past two decades and involves analysis of isotopomers by MS and/or NMR (for reviews see [10–16]). In this article, we use the nomenclature followed by most biological investigators , in which there are two types of isotopomers: (i) positional isotopomers, which have identical global isotopic composition but differ by the position of the heavy atoms in the molecule; and (ii) mass isotopomers, which differ by the number of heavy atoms in their molecules, resulting in different molecular weights. Here, we focus on the application of proteomics, metabolomics and the related approach of fluxomics to understand the function of dystrophin, the protein associated with muscular dystrophy, through a widely used mouse model of the disease. However, our purpose is not to focus on the disease per se, but to use this as a model for what the 'downstream' high-throughput approaches have to offer to functional genomics and high-throughput mouse phenotyping and how such approaches can contribute to our understanding of the consequences of a specific genotype and/or therapeutic strategies. Duchenne muscular dystrophy (DMD) is an X-linked recessive disorder, affecting one in roughly 3,500 male births, and is characterized by progressive muscle wasting, culminating in death from respiratory or cardiac failure [17, 18]. The mutated gene that causes DMD was identified in 1986  and is currently the longest gene known, covering 2,400 kilobases. It is composed of at least 85 exons, which have been conserved throughout evolution, and introns make up 98% of the gene. The dystrophin gene encodes many different tissue-specific dystrophin isoforms generated by use of alternative promoters and differential splicing [20, 21]. In 1987, the product of the gene was identified as dystrophin . It is a rod-shaped cytoplasmic protein consisting of over 3,500 amino acids and is a central part of the dystrophin-associated protein (DAP) complex that connects the cytoskeleton of muscle fibers to the extracellular matrix. Most DMD patient mutations introduce premature stop codons that disrupt the reading frame, resulting in very little or a complete lack of dystrophin, whereas patients with Becker muscular dystrophy (BMD), a less severe form of muscular dystrophy, have mutations that maintain dystrophin's open reading frame, resulting in reduced expression of dystrophin or generating a truncated partially functional protein . Of potential broader clinical relevance, changes in the structural integrity of dystrophin have recently been documented in patients with end-stage dilated, ischemic and viral cardiomyopathies and thus may represent a common pathway for contractile dysfunction in the failing heart [24–26]. There are several human isoforms of dystrophin proteins in various parts of the body. In fact, there are three full-length isoforms of dystrophin: M-dystrophin, found in muscle and, to a small extent, glial cells in the brain; P-dystrophin, found in the Purkinje cells of the cerebellum; and C-dystrophin, found in the cerebral cortex . Furthermore, there are several truncated forms of dystrophin . The purpose of these isoforms, particularly those found in non-muscle tissue and the truncated forms, are not understood [27, 28]. This illustrates the difficulty with moving from the genome to an understanding of the proteome. Despite the wealth of information now available on the structure and role of dystrophin, predominantly in skeletal muscle, its exact function is still hotly debated. Being an integral member of the link between the cytoskeleton and the extracellular matrix, dystrophin is hypothesized to have a role in stabilizing the sarcolemma (the muscle cell membrane) and maintaining muscle fiber integrity during muscle contraction [29–31]. Dystrophin may also participate in the regulation of intracellular calcium levels . There is also evidence of increased activity of the calcium leak channel in dystrophic muscle , which in turn can lead to elevated levels of proteases in dystrophic tissue. Additional roles hypothesized for dystrophin include a role in force and signal transduction processes and in the aggregation of neurotransmitter receptors. In normal muscle, neuronal nitric oxide synthase (nNOS) associates with syntrophin in the DAP complex. However, nNOS is absent from the skeletal-muscle sarcolemma in DMD patients . Interestingly, a recent study by Acharyya et al. provided evidence that dystrophin itself can mediate signals relevant to muscle atrophy and hypertrophy, possibly involving Akt signaling. Finally, at least in the heart, dystrophin has also been recently proposed to be an end-target of ischemic preconditioning, a powerful cardioprotective intervention . One of the most widely used models of this disease is the mdx mouse, which also has a missense mutation in the gene for dystrophin . The skeletal muscle of mdx mice has a disrupted membrane skeleton with regions of the sarcolemma devoid of costameres (the structures connecting the force-generating sarcomeres with the extracellular matrix) , and their cytoskeletal γ-actin has been found not to be stably associated with the sarcolemma . Although the mdx mouse has a pronounced hunch, lower muscle regenerative capacity and cardiomyopathic abnormalities compared with wild-type controls [40, 41], the phenotype of the disorder is milder in the mouse than in human sufferers unless the mouse is subjected to physical exercise  or to ex vivo or in vivo increases in mechanical workload [43, 44]. The mouse has only a modest decrease in life expectancy, whereas human sufferers of DMD experience severe muscle wasting culminating in death within the second decade. This suggests two alternative and not mutually exclusive hypotheses. Firstly, other proteins may compensate the failure to express dystrophin in the mouse but not in humans. Alternatively, it may be that the mouse in a cage is not subject to the same stressor events as humans. It also highlights the difficulties that remain moving from a genomic description of a disease to an understanding of the functional phenotype in different organisms. In terms of species differences, one important difference in the development of the mdx mouse compared with human DMD sufferers is that skeletal muscle tissue in the mouse undergoes a wave of necrosis followed by recovery at 2-3 months. This recovery is absent in the development in humans. Identification of the mechanisms involved in muscle recovery may identify potential ways to treat the disorder in humans. It also shows that tools are needed to place the milder phenotype detected in the mouse in the biological context of an altered proteome and metabolome. Given the central importance of dystrophin in maintaining the connection between the cytoskeleton and the extracellular matrix, a proteomic approach to understanding the disease, perhaps investigating the changes induced in the DAP complex, would be expected to be highly profitable. However, when Ge and colleagues  examined the changes in protein expression in the hindlimb muscles of three-month old mdx mice using a combination of two-dimensional gel electrophoresis and MS, the largest change was associated with a decrease in abundance of adenylate kinase 1, which was confirmed by biochemical assay. Doran and colleagues  used a similar approach based on two-dimensional fluorescence difference gel electrophoresis (DIGE) to demonstrate an increase in levels of the heat-shock protein cvHSP in the diaphragm, along with alterations in 35 out of 2,398 detected proteins, with decreased expression of the F-box protein Fbxo11, adenylate kinase, β-hemoglobin and dihydrolipoamide dehydrogenase and increased expression of cvHSP, aldehyde reductase, desmin, vimentin, chaperonin and cardiac and muscle myosin heavy chain. So why have these studies highlighted alterations in metabolism and responses to stress, rather than alterations in the DAP complex? It is important to consider some of the limitations of proteomic approaches based on two-dimensional gels. Many low-concentration proteins can be obscured by highly expressed proteins, which dominate the two-dimensional gels. In particular, many of the enzymes involved in key metabolic pathways, such as adenylate kinase, are both readily separated on a two-dimensional gel and found in high concentrations in the cell and thus would be expected to be prominent in a global analysis of proteins that separate by two-dimensional gel electrophoresis. An alternative approach is to try a targeted analysis. To test the hypothesis that dystrophic muscle is more susceptible to cell death because of altered Ca2+ handling, Doran and colleagues  used the cationic carbocyanine dye 'stains-all' to specifically examine the Ca2+ binding proteins and demonstrated a reduction in luminal Ca2+-binding proteins, including calsequestrin, in skeletal muscle. The deregulation of Ca2+ homeostasis has since been confirmed by proteomics in the diaphragm, skeletal muscle and heart . However, to test a hypothesis one does not need to always target the analysis, but can tailor the method for processing the data. Gulston and co-workers  used the multivariate regression technique prediction to latent structures by partial least squares (PLS) to regress proteomic changes by DIGE in order to investigate age-related changes in heart tissue of the mdx mouse. Intriguingly, this approach showed that the dominant proteomic changes associated with age were the same in control and mdx mice. However, at each time point the dystrophic heart tissue showed differences in mitochondrial proteins, particularly those associated with the electron transport chain and ATP synthesis. With recent advances in MS, two-dimensional gel-based proteomics has been faced with the problem of too many proteins being detected in a dataset, with spots on the gel often containing several proteins. To address this problem, several groups involved in heart and skeletal muscle proteomics have focused on organelle proteomics or tried targeted approaches by looking at proteins that bind to a given target. Metabolic deficits or alterations have been reported in both muscle - skeletal and heart - and brain tissue [40, 50–54]. Furthermore, many of these changes are age specific and will vary across the lifespan of the mouse. Although these studies often confined themselves to one tissue and a small subset of metabolites, in many cases these could be considered the front-runner studies to a metabolomics study of the mdx mouse. One particularly elegant set of studies was performed by McIntosh and co-workers [40, 41], who established that skeletal muscle taurine content correlated with the regenerative capacity of muscle tissue in three mouse models: mdx, MyoD (mutant in a protein with a key role in regulating muscle differentiation) and mdx:MyoD cross mice, all at 4 months of age. Using in situ hybridization and autoradiography, the transcription of key genes involved in muscle cell proliferation (myogenin and Myf5) were monitored and compared with the tissue content of taurine, with mdx tissue having the highest concentration of muscle taurine as well as the greatest number of muscle proliferative cells of the three mouse types. Metabolic abnormalities have also been characterized in cerebral tissue in sufferers of DMD and the mdx mouse using chemical assays or 1H, 31P and 13C NMR spectroscopy [55–57]. This reflects the fact that DMD sufferers experience a non-progressive intellectual deficit. In both mdx mice and DMD sufferers the cerebellum contains an increased concentration of choline-containing compounds, as measured by the choline:N-acetyl aspartate ratio and the choline:creatine ratio . Curiously, the choline:N-acetyl aspartate ratio correlated with improved neurological performance in DMD boys, suggesting that it may be involved in a compensatory mechanism. Applying techniques developed for following drug toxicity using a combination of 1H NMR spectroscopy and principal components analysis , Griffin and co-workers  examined a range of tissues from the mdx mouse, including cardiac (Figure 1a), diaphragm, soleus (calf muscle), cerebral cortex and cerebellum at 6 months of age. Dystrophic muscle tissue from heart, diaphragm and soleus were similarly perturbed metabolically by a failure to express dystrophin, despite being very different types of muscle; this was characterized by an increase in taurine and lactate and a decrease in creatine in tissue extracts from dystrophic tissue. This is in keeping with the single protein isoform known to be involved in all these tissue types, and that presumably has a similar role in all these tissues. These changes could be detected even in intact tissue using high-resolution magic angle spinning 1H NMR spectroscopy, which also identified a significant increase in lipid infiltration in dystrophic tissue . Similarly, extracts of cerebellum tissue from mdx mice were readily distinguished from wild-type controls by their metabolic profiles, including a characteristic increase in phosphocholine. The approach even found a weak separation in cortical tissue extracts, although this had not been detected by previous studies. The changes in profiles of dystrophic muscle, cortex and cerebellum tissue were all distinct, suggesting very different roles for the three iso-forms of dystrophin in the tissues. Applications of metabolomics and proteomics to the mdx mouse. (a) A typical high-resolution 1H NMR spectrum from an aqueous extract of cardiac tissue from the mdx mouse. The chemical shift and splitting pattern of a given resonance (peak) enables the identification of the metabolite it belongs to, and the area under the resonance determines the concentration of that metabolite. (b) An orthogonal signal corrected partial least squares discriminate analysis plot of various mouse models of cardiac disease using solution state NMR spectroscopy. Key: circles, control + mdx; diamonds, model of cardiac hypertrophy (MLPKO); squares, model of cardiac arrhythmia (Scn-/+); triangles, model of cardiac arrhythmia (ScnΔ /+). (c) Correlation analysis between identified proteins in a proteomic study of heart tissue from mdx mice and the intracellular concentration of taurine. When detected by 1H NMR spectroscopy (bottom graph), taurine can be identified by two triple peaks at δ 3.25-3.27 and δ 3.42-3.46. The correlation heat map between spectral intensity and protein expression was used to determine which proteomic changes were associated with the increase in taurine in dystrophic muscle. The x axis is the chemical shift region containing the resonances from taurine; the y axis consists of protein spots detected in the two-dimensional gel electrophoresis. The color scale displays the correlation coefficients between the two sets of data (concentration of taurine against concentration of protein). To investigate whether metabolic profiles could be used to predict the proteomics of a disease or therapy regime, the 1H NMR derived metabolic profiles of cardiac and diaphragm tissue from four different mouse models with mutations in the dystrophin or utrophin genes were examined . Utrophin is functionally related to dystrophin, and its up-regulation in skeletal muscle has been considered as a gene therapy approach for treating DMD. During fetal development, utrophin is found over the entire surface of muscle fibers, but is replaced by dystrophin during development, and utrophin becomes localized to the neuromuscular junction in adult skeletal muscle [61–63]. The dystrophic phenotype normally observed in mdx mice is absent when muscles overexpress utrophin [64, 65]. Furthermore, utrophin has a particularly favorable characteristic in dystrophic tissue; although the body can treat dystrophin as a foreign protein, mounting an immune response; increasing the innate expression of utrophin does not have this pitfall . In this metabolomic study , the PLS technique was used to regress the metabolic profiles of tissue extracts against the relative protein content of dystrophin and utrophin in four mouse strains: (i) the mdx mouse, which does not express dystrophin; (ii) Tgfull-length/Dmd mdx , a transgenic mouse expressing full-length utrophin in skeletal muscle but not heart crossed with the mdx mouse to produce mice lacking dystrophin but with utrophin localized at the sarcolemma ; (iii) Tg/Dmd mdx ;utrn-/-, a transgenic mouse expressing a truncated utrophin transgene crossed onto a Dmd mdx /utrn-/-double mutant background, resulting in a mouse with no dystrophin in skeletal muscle but with a truncated utrophin transgene and heart with no dystrophin or utrophin ; and (iv) the control mouse to (iii), Tg truncated /Dmd mdx , which has no dystrophin but expresses utrophin. The PLS models readily classified tissue according to dystrophin content for the heart and diaphragm . Examining the diaphragm, models were built that described both dystrophin and utrophin expression. Furthermore, increased utrophin expression in dystrophic diaphragm tissue produced a metabolic phenotype between that of the wild-type tissue and that of the dystrophic tissue, suggesting that increased utrophin expression counteracts some of the deficits associated with dystrophic tissue. The major metabolite responsible for classification of tissue into controls and dystrophic was taurine, in keeping with it being a potential marker of muscle regenerative capability. This suggests that metabolic profiles of muscle tissue could be useful in monitoring the efficacy of potential treatment regimes, such as gene therapy. Cole and colleagues  have also examined the impact that protein expression of utrophin and dystrophin has on muscle metabolism, using 1H and 31P NMR spectroscopy to examine ATP turnover in mdx mice, utrophin and dystrophin knockout mice and controls. In particular, the hind-limb muscle in the double knockouts had reduced concentrations of ATP and creatine and increased intracellular phosphate and ADP. Indeed, ADP could distinguish all three mouse models examined. Whereas it is clear that metabolomics and related approaches can readily distinguish dystrophic tissue from that obtained from wild-type controls for skeletal muscle, heart and brain tissues, a word of caution is necessary when considering how these results relate to human sufferers. One must remember that the mdx mouse is relatively healthy in comparison with human sufferers of DMD. Jones et al. used high-resolution 1H NMR spectroscopy to investigate the metabolome of heart tissue from the mdx mouse, two mouse models of cardiac arrhythmia and one of cardiac hypertrophy (Figure 1b). Surprisingly, the dominant effect was the strain background of the mice rather than the diseases they modeled, suggesting that mouse models may have very different phenotypes depending on the strain background on which they are generated. However, multivariate statistics were capable of separating each mouse model from its control strain, showing that metabolic profiles could be generated for each disease. So far, the steady state concentrations of metabolites in heart tissue have mainly been assessed by NMR spectroscopy. However, because of the small population differences associated with NMR spectroscopy, only a relatively small number of metabolites can be detected. To expand the metabolome, Atherton and colleagues [71, 72] have used a combination of NMR spectroscopy and gas chromatography mass spectrometry (GC-MS) to detect over a hundred aqueous metabolites and fatty acids. This has expanded the coverage of the metabolome to over 250 individual species, an order of magnitude more than those measured in the mdx mouse. Han and co-workers  have used shotgun (direct infusion) MS to show that cardiolipin depletion in the diabetic myocardium is a potential cause of mitochondrial dysfunction. 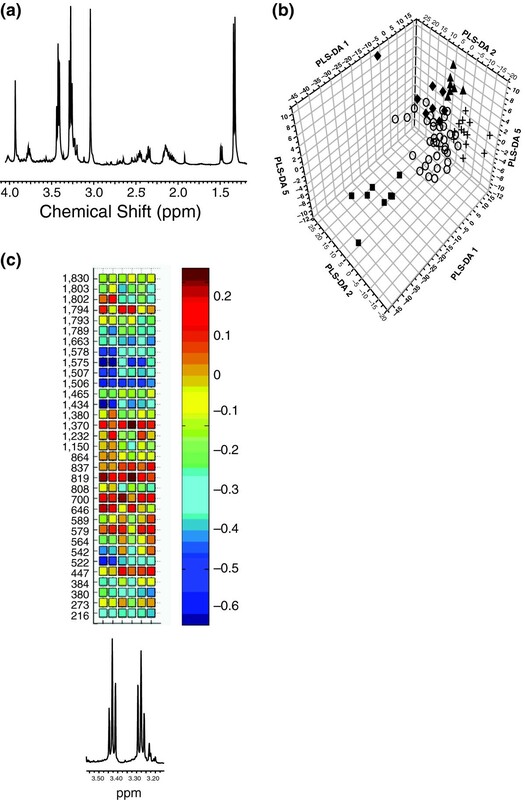 Expanding the shotgun approach to negatively charged water-soluble metabolites using matrix-assisted laser desorption ionization tandem time of flight MS (MALDI-TOF/TOF MS), the group  have profiled over 285 chromatographic peaks in heart tissue. These studies all indicate that metabolomic studies of the mdx mouse have only scratched the surface of the metabolome. The recent application of metabolic flux analysis to the mdx mouse heart has provided an unexpected insight into the metabotype [54, 75]. Khairallah et al. compared control C57BL/10 and dystrophin-deficient mdx hearts from mice at an age (10-12 weeks) during which there are no major histological or echocardiographic abnormalities or differences in metabolic gene expression or metabolite concentrations as revealed by metabolomics . This was achieved using ex vivo heart perfusion in the working mode combined with a 13C labeling methodology involving mass isotopomer analysis by GC-MS. Principles and theoretical ideas relevant to the use of 13C-isotopomer analysis as applied to cardiac metabolism and methodological details on the working heart perfusion model have been described in detail [15, 54, 76]. This experimental paradigm enables detailed and simultaneous determinations of various hemodynamic and metabolic flux parameters relevant to energy production. In the heart studies described by Khairallah et al. four different substrates uniformly labeled with carbon 13 (U-13C) were used to probe metabolism in the mdx heart: the long-chain fatty acid (LCFA) [U-13C18]oleate and the carbohydrates (CHO) [U-13C3]lactate, [U-13C3]pyruvate and [U-13C6]glucose. 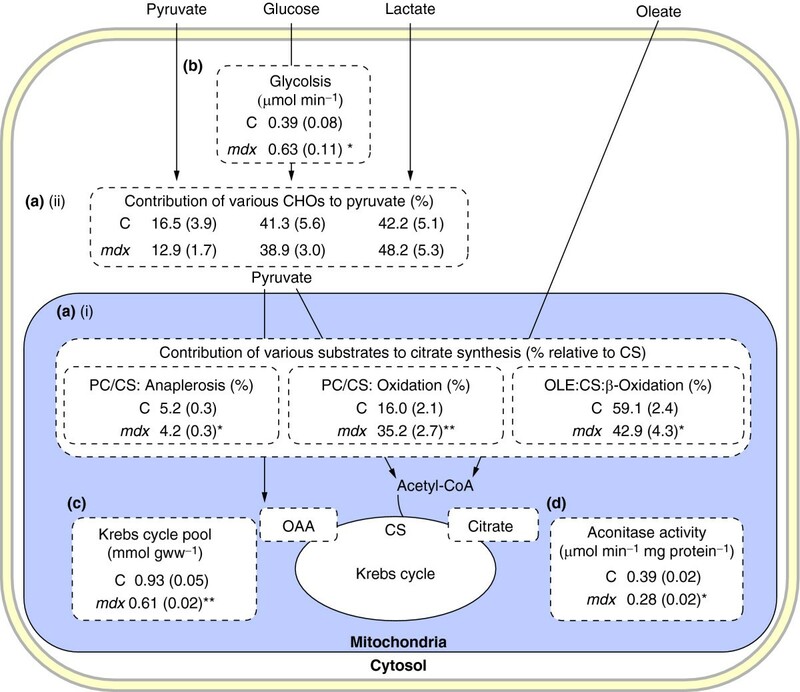 Metabolic flux ratios that were assessed revealed cytosolic glycolysis, substrate selection (CHO versus LCFA) for mitochondrial acetyl-CoA formation for citrate synthesis (energy production), and pyruvate partitioning between decarboxylation (oxidation by pyruvate dehydrogenase) and carboxylation (by pyruvate carboxylase); see Figure 2. It is noteworthy that pyruvate carboxylation participates in the refueling of catalytic Krebs cycle intermediates, that is, in anaplerosis, a process that is proposed to have a crucial role in optimal cardiac energy production . Metabolic flux ratios assessed in working control (C) and mdx mouse heart perfused with 13 C-labeled substrates. Data are given as means ± standard errors (indicated in parentheses); n = 4-8 in each group. Reactions are shown in the part of the cell in which they take place. (a) Flux ratios. (i) Flux ratios reflecting the contribution of exogenous fatty acids (oleate) and carbohydrates (CHOs: lactate, pyruvate and glucose) to acetyl-CoA formation (energy) and oxaloacetate (OAA; anaplerosis) via oleate β-oxidation (OLE), pyruvate decarboxylation (PDC) and carboxyation (PC), respectively, and expressed relative to citrate synthesis (CS). (ii) Flux ratios reflecting the contribution of individual CHOs - as indicated by the individual arrows - to pyruvate formation, expressed in percentage of total. (b) Glycolytic rate, which reflects the production of lactate and pyruvate, in μmol × min-1. (c) Tissue concentration of Krebs cycle intermediates, in μmol × g wet weight-1. (d) Tissue aconitase activity, in μmol × min-1 × mg protein-1. *p < 0.05, #p < 0.001 for mdx versus control mouse hearts. Adapted from Khairallah et al. . Compared with controls, working mdx mouse hearts had an altered mitochondrial energy substrate metabolism, as reflected by a marked shift from LCFA to CHO oxidation for energy production; decreased anaplerotic pyruvate carboxylation; and enhanced glycolysis . These changes were associated with exacerbated oxygen consumption and with compromised function and integrity of the sarcolemma, as reflected by lactate dehydrogenase release. Subsequent targeted metabolite and protein analyses also revealed a marked decrease in the myocardial mitochondrial Krebs cycle pool size and lower activity of the Krebs cycle enzyme aconitase, which further substantiate the presence of mitochondrial metabolic alterations in the heart of young mdx mice. Although a substrate shift from LCFA to CHO, which is a characteristic of several models of cardiomyopathies, could be beneficial for the heart (for recent reviews see [78, 79]), the decreased levels of Krebs cycle intermediates and decreased aconitase activity would be expected to limit the ability of the dystrophic heart to enhance Krebs cycle flux and thus limit mitochondrial energy production under conditions of high energy demand. A shift from LCFA to CHO oxidation in the dystrophic mdx mouse heart agrees with results from cardiac positron emission tomography studies in patients with DMD, using 18F-deoxyglucose or a radioiodinated branched fatty acid ([123I]15-(p-iodophenyl)-3-(R,S)-methylpentadecanoic acid (BMIPP)) [80, 81]. However, the aforementioned substantial differences in the concentrations of Krebs cycle intermediates between control and mdx groups documented in ex vivo hearts perfused in the working mode contrasted with the small changes documented in these hearts freeze-clamped in vivo , which also agreed with recent metabolomic data . This discrepancy between results obtained ex vivo and in vivo suggest that despite providing what are generally accepted to be physiological levels of workload, nutrients and calcium supply, the ex vivo perfusion environment unmasked major abnormalities of mdx cardiac function and energy metabolism thereby exacerbating the observed changes. Because these abnormalities are not readily detected in vivo at this stage of the disease in the mdx mouse, one would presume that homeostatic compensatory mechanisms in the intact animal obscure these changes. Numerous candidate mechanisms have been considered to explain the documented metabolic flux alterations in perfused dystrophin-deficient hearts at such an early compensatory phase of the cardiomyopathy before heart failure. These include the activity of cell signaling pathways and changes in metabolic gene expression. Ultimately, defective NO/cGMP signaling was hypothesized, as it seemed to reconcile all data. Subsequent testing for this cGMP signaling defect using transgenic and pharmacological approaches showed improvement in contractile performance, myocardial metabolic status and sarcolemmal integrity, thus suggesting a potential clinical avenue for the treatment of the dystrophin-related cardiomyopathies . In summary, results obtained using the ex vivo working mdx mouse perfused with 13C-labeled substrates together show how changes in myocardial metabolic fluxes may be a subclinical signature of defective cell signaling that occurs before overt cardiomyopathy as well as providing a basis for therapeutic strategies. The concomitant documentation of pathophysiological changes (impaired contractile function and membrane integrity) highlights the power inherent in measuring metabolic fluxes as one part of predicting the physiological phenotype of any organism. These data also suggest a crucial role for myocardial dystrophin in maintaining optimal coupling between energy metabolism and contraction. Although the described 13C-labeling paradigm focused on the measurements of carbon flow through the Krebs cycle and related energy-producing pathways in the heart, additional flux parameters could have been easily assessed by extending the number of metabolites that were analyzed by GC-MS. For example, in another study, Khairallah et al. also evaluated the 13C-enrichment and concentration of LCFA in triglycerides to assess flux pertaining to lipid partitioning between mitochondrial β-oxidation (for energy) and triglyceride synthesis (for storage), a process that can be used to monitor the toxic effects of lipids, referred to as lipotoxicity. Although the number of molecules analyzed can be increased by using a combination of MS and NMR techniques [15, 83], the choice of 13C-labeled substrates can also determine the number of metabolic flux parameters that can be extrapolated in a given single experiment. In this regard, recent studies demonstrated the potential of other 13C-labeled substrates (for example [1,2-13C]glucose, [U-13C]glutamine and deuterated water) [12, 83–90]. However, the use of isolated intact organs or cells can also unmask abnormalities that are not readily observed in vivo because of the existence of compensatory mechanisms in the intact organism, as was the case for the isolated mdx heart study [54, 75]. Finally, there are several pitfalls to be wary of in the application of metabolic flux analyses, including corrections for natural stable isotope abundance and the presence of overlapping fragments, which affect the accuracy and precision of MS-based analyses [15, 16, 77, 91–95]. There are also limitations associated with the assumptions on which the equations that form the metabolic models from which flux ratios are calculated [96–98]. Technological advances are improving the number of proteins and metabolites that can be measured by combining NMR- and MS-based technologies. Recent studies clearly show the added value of dynamic metabolomics or fluxomics as applied to the discovery of metabolic pathways related to hepatic gluconeogenesis [87, 88] or to the probing of drug therapy in cultured cells [84–86]. However, although metabolomics and proteomics are approaches that lend themselves to functional genomic analyses, the accurate and precise determination of metabolite fluxes is substantially more time consuming and cannot be readily adapted for functional genomic analyses. Furthermore, even with improvements in analytical technology, one problem common to proteomics, metabolomics and fluxomics is the incomplete coverage of the tiers of organization. Proteomics and metabolomics detect only a small subset of the total proteome and metabolome, and fluxomics tends to focus on discrete pathways determined in part by the substrates that are used for the analysis. One method to remedy this is to combine the analysis of different '-omes'. Although, so far, there are only few examples of such studies [49, 99–102], this is likely to be a rapidly expanding field. We have illustrated the potential added value of combining information from proteomics, metabolomics and fluxomics as applied to the mdx mouse. Indeed, the combined metabolomics and proteomics (by DIGE) approach used by Gulston and coworkers  enabled the demonstration of a correlation between the characteristic increase in taurine found in the heart and skeletal muscle of these mice and proteins associated with oxidative phosphorylation and mitochondrial metabolism (Figure 1c). Conversely, flux studies in the working mdx mouse heart further substantiated the specific mitochondrial alterations related to energy substrate metabolism in the Krebs cycle , which were not apparent in histology or echocardiograms, or detected by transcriptomics or metabolomics at this age  and provided the basis for a successful therapeutic intervention . Collectively, these data point to perturbations in proteins, metabolites and metabolic fluxes that reflect mitochondrial energetic alterations in skeletal and heart muscles at an early stage of the dystrophic pathology. In conclusion, we have examined how recent advances in proteomics, metabolomics and fluxomics have been used to study various aspects of a pathophysiology, as applied to muscular dystrophy. These approaches have produced new insights not only into the disease process, which provides a basis for therapeutic strategies or for biomarker screening, but also into the basic biology of the cell. Such studies will take the field from a genomic description towards a fuller understanding of the systems biology of the disease. prediction to latent structures by partial least squares. Cardiac work in the Griffin laboratory is supported by the Royal Society, UK (University Research Fellowship to JLG), the Wellcome Trust, the British Heart Foundation and GlaxoSmithKline. This study was supported by the Canadian Institutes of Health Research (Grant no. 9575 to CDR). The authors thank Melanie Gulston for careful proofreading of the manuscript. The authors contributed equally to the writing of this article.